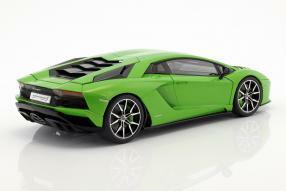 Friends of the Lamborghini Aventador can put the high-profile sports cars on their shopping list, since March 2011. Presented at the Geneva Motor Show as the successor of the Murciélago, the supercar was already in the sixth year of production, when the Aventador S version was released. Autoart - own spelling AUTOart - has released modelcars that know how to inspire with their build quality and detailing. 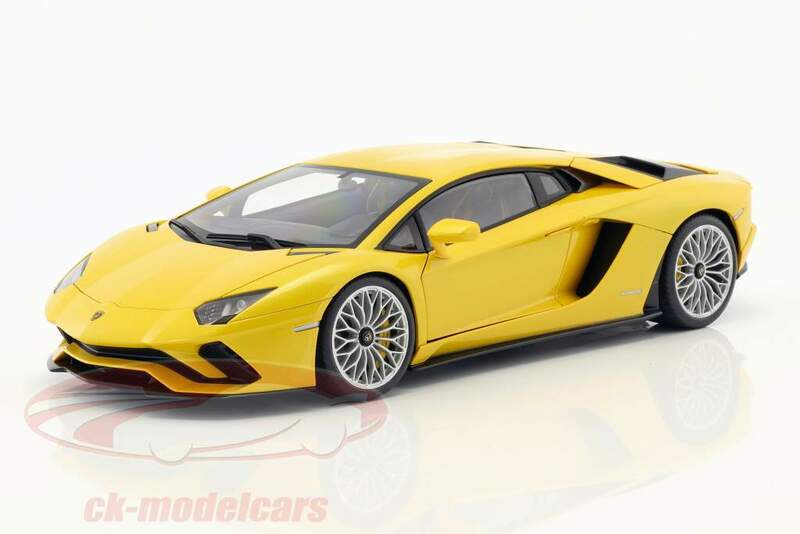 The miniatures are made out of diecast and luckily have doors and hoods that can be opened, because there is a lot of high-quality technology under the outer skin of the Aventador S. His name goes back to the name of a fighting bull, who was awarded as particularly brave in 1993. Let's take a closer look at the characteristics of the 1:18 scale models in the arena. Autoart offers the miniatures of the Aventador S 2017 in four colors: To the previous colors pearl yellow and pearl blue with the item numbers 79132 and 79134, two further colors, pearl white and mantis green, have joined the already existing models with the new delivery last week (79131, 79133). The modelcars are made out of zinc die-cast with functional parts all around. The scissor doors open as in the role model inclined forward and also get a replica of the gas pressure lifter from Autoart. The label offers not only very small gaps dimensions and thus perfectly fitting doors and hoods, but also the technical details. That the appearance of the modelcars, in look and design, corresponds exactly to the role model is superfluous to mention, because of course! 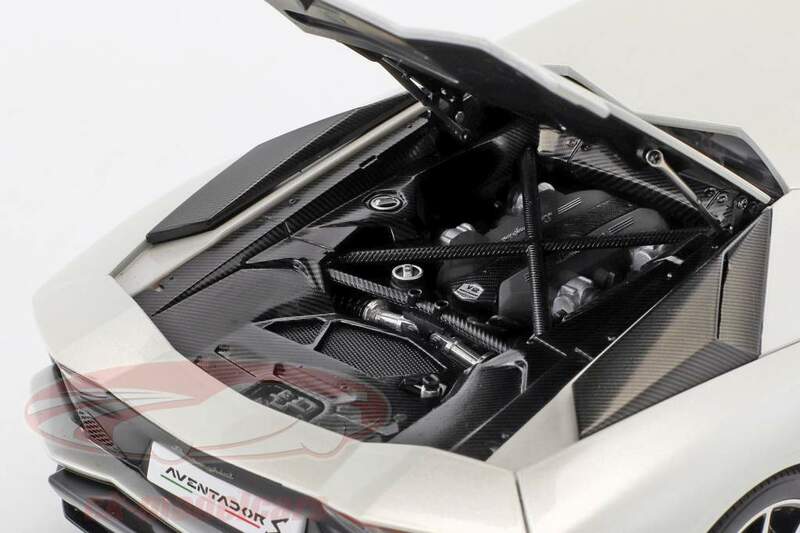 Behind the slaved correctly recreated, with the model Aventador S 2017 introduced aerodynamic improvement at the front apron is a trunk, which is accessible via the openable front hood. The meticulousness with which Autoart retells the outer skin is also used in the reduction of the interior space: the dashboard, the shift paddles as well as the seat system and inner door paneling have succeeded to the last switch! The upper shell of the instrument panel picks up the carbon, which is also reflected in the angle of the ventilation opening behind the rear side window, around the tailgate and in the engine compartment. The self-supporting monocoque of the role model of our modelcar was mainly made of carbon fiber reinforced plastic. Therefore, the reference to the material carbon even with these smaller features. Under the bonnet, which can be wide opened at the model car, we discover the replica of the V12. 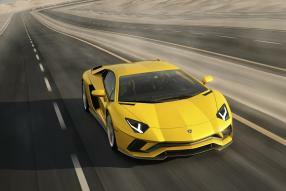 In the Aventador S, the successor to the LP700-4, the power pack delivers 544 kW / 740 hp, which is connected to a seven-speed sequential gearshift. The 48 valves are driven by four camshafts. In 2.9 seconds, the Avantador S accelerates to 100 km; in 8.5 seconds, the super sports car reaches the 200. At 350 kilometers per hour, the car is electronically locked. The top speed is therefore limited, but fortunately, no electronics mingles with our passion for the models of the Aventador S. Because it really takes off when looking at the build quality of these admittedly not quite cheap, but beautiful models that can be the basis for a closed collection theme! © JT / LH, Foto Aventador S: Copyright © 2017 Automobili Lamborghini S.p.A.